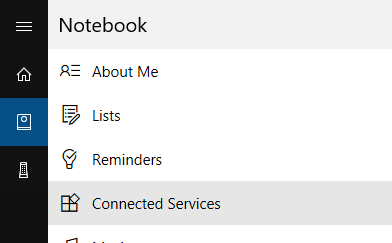 If you’re using Cortana, the voice activated intelligent digital personal assistant, in Windows 10 to help you perform your daily routine, and if you’re also using Gmail for your email, contacts and/or calendar, your life is about to get easier. 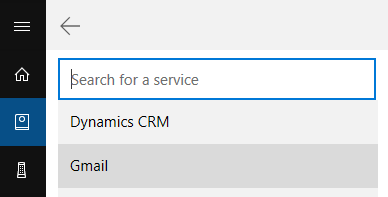 Gmail is now officially supported as one of the connected services for Cortana in Windows 10, joining the rank of other Cortana’s connected services such as Knowmail, LinkedIn, Office 365, Outlook.com, Skype, Wunderlist and Dynamics CRM. What it means is that you can now access information from the Gmail account by using Cortana. By connecting Gmail to Cortana, you can use Cortana to quickly access information about email content in Gmail Inbox and other mailboxes, contacts and calendar details such as events and reminders from the Google account. Cortana will use this information to offer you personalized experience and relevant suggestions in Microsoft products that offer Cortana experiences. Open Cortana (click or tap on Cortana Search bar or Cortana icon). Open the Cortana’s Notebook on the left pane. Hit + Add a service. Click or tap on Connect button. 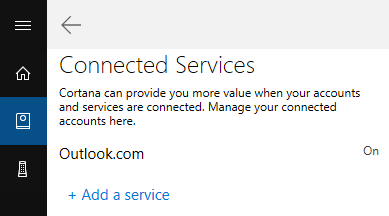 A separate window will open for you to sign into Google Account for the Gmail account that you want to link to Cortana, and grant the necessary permissions to Cortana to access and manage the mails, contacts, calenders and Google Drive files. Once connected, you can now access your Gmail and other Google contents through Cortana.